Experience the full motion a waterbed mattress has to offer. This free flow waterbed does not contain any wave reducing material. Free flow waterbeds are great for reducing pressure so you can enjoy a better night's sleep. -- Please Select --Super Single - 48" x 84" Queen - 60" x 84" Cal King - 72" x 84"
A free flow waterbed mattress helps reduce pressure and body stress to allow you to experience a better, deep rejuvenating night's sleep. The Boyd Free Flow Waterbed Mattress is made of high quality long-lasting vinyl with a precision design and reinforced corners for extra strength. A free flow waterbed mattress does not contain any wave reducing material, allowing you to experience the full motion that the waterbed mattress has to offer. 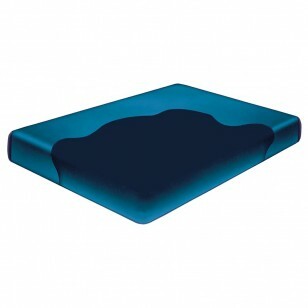 This full motion free flow waterbed mattress is meant to be used with a hard-side wood waterbed frame. If you love the traditional 'old time' type waterbed mattresses, then this is the bed for you. We have been using our mattress for about a month and it is working well just as expected. The mattress is great ! So glad we found Boydwaterbeds.com, we tried to find a waterbed mattressg in town and had no luck. None of the mattress stores carry waterbed supplies any more. Thanks for quick delivery.